A nice quality bench at a great price. 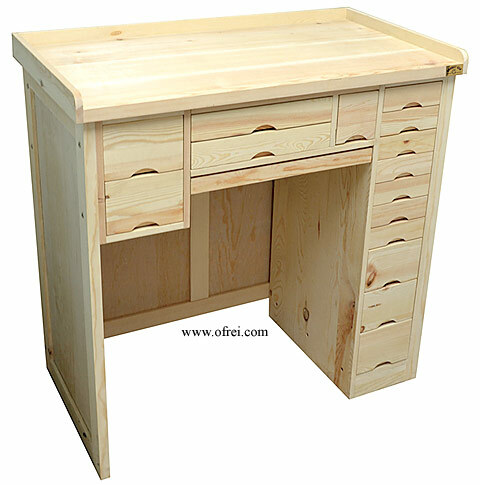 Bench features include: Solid wood top, railings, sides and faces. Full length side and back panels. 15 drawers. 19" watchmakers catch tray. 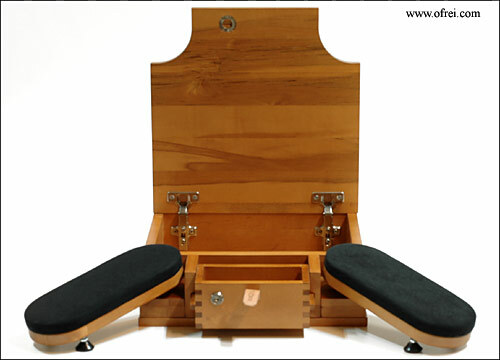 This bench is dropped shipped from our Warehouse direct to your home or office. We can now ship this bench by UPS or FedEx Ground shipping. Due to this item being an oversized item, you will be sent an E-mail notifying you the amount of shipping cost you will be charged. Shipped in two boxes. Dimensional shipping weight is 199 lbs. Box 1 Dimensions are 39 1/2" x 20 1/2" x 22". Box 2 Dimensions are 42" x 8 1/2" x 24"
The cost of shipping to a residential address in the 48 states is between $110.00 to $235.00, while the average price has been about $130.00. Some assembly is required. 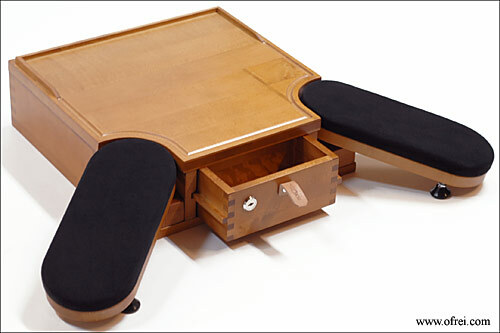 When fully assembled, bench dimension measures 39-1/4" Wide x 21-1/2" Deep x 39" High. 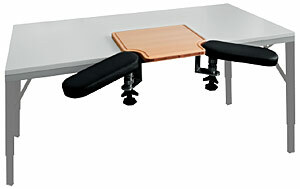 Bergeon Swiss made table top fixes to many flat surface tables and converts it to a workbench with armrests. 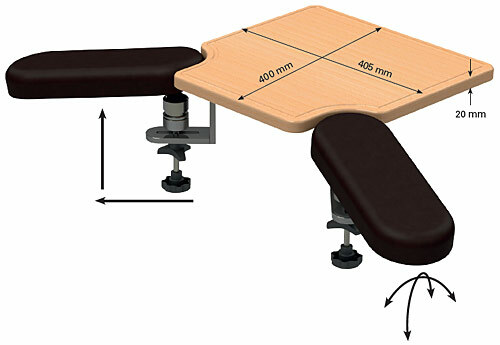 Table top measurement: 400 x 405 x 20 mm. 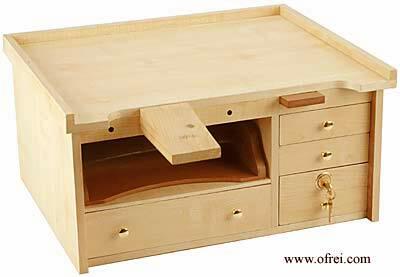 Installation: Secure the frame by drilling the screws into place on the flat surface table. Using the supplied double sided tape, affix the table top onto the frame. 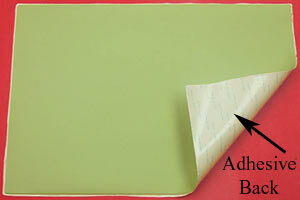 Inexpensive plastic mat with special sticky back without adhesive. Ideal for apprentices and employees, when you don't want them using your more expensive rubber mat. Measures 350 x 240 x 0.5 mm (13 3/4" x 9 1/2" x 1/32"). Sold as a pack of 5 pieces. Chinese Made Anti-Static Rubber Bench Mat with self adhesive back. 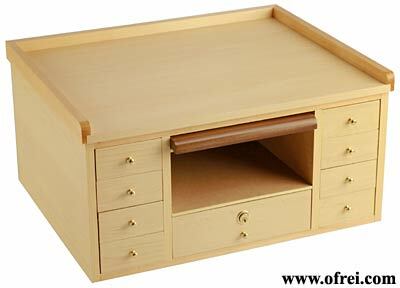 Measures 350 x 220 x 2 mm (13 3/4" x 9 1/4" x 1/16"). 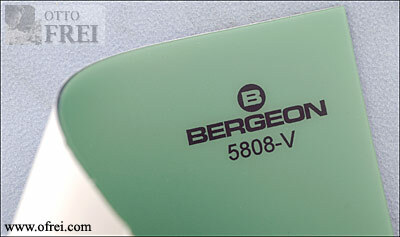 Very fine quality, Bergeon vice, width of jaws 45 mm. Jaws open up to 35 mm. Only the fixing plate is permanently screwed to the bench. 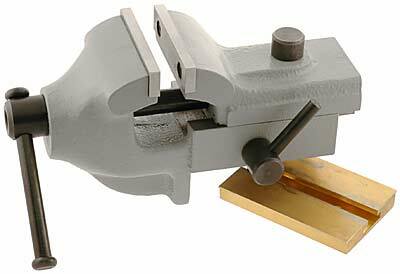 The vice can be set up or removed in a few seconds. Reliable clamping device. Smooth, parallel jaws. 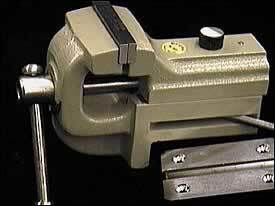 Similar to the Bergeon Bench Vice. The plate is screwed onto the bench and the vice can slide on and off. Jaws open up to 22 mm. Width of jaw is 46 mm.